Nancy came to Wellington after obtaining her first degree in her native Germany, and an M Sc from the University of London, to undertake a PhD at VUW using ice cores to study climate history over the last century for the McMurdo Sound region of Antarctica. After completing the degree in 2004 she continued ice core investigations along the Transantarctic Mountains, and developed ice core research as a new discipline in New Zealand. 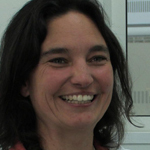 Currently she is Chief Scientist for the international Roosevelt Island Climate Evolution (RICE) project, http://www.victoria.ac.nz/antarctic/research/research-prog/rice/) , coring for the 30,000 years of climate history in the region. Nancy has now led 11 expeditions to Antarctica, and has developed and manages the New Zealand Ice Core Research Laboratory at GNS Science.